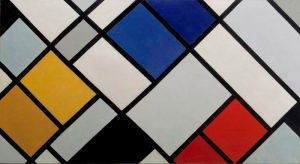 The De Stijl Movement – translating to ‘the style’ in Dutch – became established in 1917 by Piet Mondrian and Theo van Doesburg. The artists of the movement were interested in geometric shapes – often straight lines, rectangles or squares – and primary colors. Their intention was to use their art as a vehicle ‘to reveal the laws governing the harmony of the world’ (theartstory.org). In De Stijl, the magazine, Mondrian defined ‘neoplasticism’ – established as the specific name for the type of abstract art practiced by De Stijl artists. 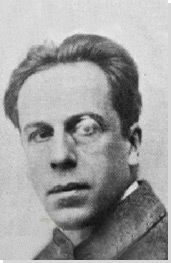 Included in the movement were architects such as Gerrit Rietveld and JJP Oud. The movement included a utopian vision and avant-garde design. In van Doesburg’s Arithmetic Composition, geometric shapes sit on a diagonal plane from the biggest shape to the smallest, extending from the bottom right corner to the top left, or vice versa. The shapes incline or decline simultaneously to and from the viewer. The viewer experiences pure positive and negative space – the black, geometric shapes placed on a two-dimensional white surface. The geometric detail in the white background is subtle, yet creates movement toward the bottom right corner, as the edge of the corner of white points toward the flat, diagonal portion of the biggest shape. Its corner is parallel to the corner in the bottom right, unifying them, and creating balance and harmony within the piece. This piece is purely abstract, as it is devoid of the possibility of representation.